In 2005, Swede Tomas Alexandersson moved to Tallinn, the capital of Estonia. As soon as he arrived, he says, “I realised that I had arrived in a city with many faces and a very rich cultural history”. His fascination with the country’s complex history led him to start collecting travel guides produced during the period of the Soviet occupation of Estonia. Eventually he started to feature the collection on a website, The Tallinn Collector, which has led to a great deal of interest both in and outside Estonia. Now he shares a selection of his favourite images with Deep Baltic, and explains what the pictures tell us about the different aspects of life in Soviet Estonia. The look is very cool. The airport has always been the link to the world from Tallinn (even if during Soviet times, you could mostly only go to other Soviet cities). Between around 1945 – 1989, Aeroflot was basically the only airline to operate at the airport. The modern look of the airport dates from the late 1970s, before the 1980 Olympic Games (as Tallinn held the Olympic Regatta). Party party party. Tallinn is a bit of a party city, and as it seems, it has always been that way. All my old tourist guides talk about just how many cafés, night clubs there are in town. Many of the places that are mentioned still exist today, like Pegasus, Tuljak Restoran and of course Viru Hotel. In these two photos you can see the café at Viru Hotel and one of the legendary variety shows. Viru Hotel was one of the few hotels open to international visitors during Soviet times, and many stories have been told about the nights there. Viru Hotel was always the queen of Tallinn – and in some ways it still is. You can really tell from the guidebooks that the hotel is something people are proud of. It was the place to be. It’s become even more fascinating since, as it now hosts the KGB Museum! The museum is definitely worth a visit. I really enjoy seeing the commercials from that time. There are lots in the guidebooks. Most of the ads are from Kalev [chocolate makers], Kaubamaja [a department store], Marat factory and the official tourist board, Intourist. Tallinn itself is an amazing city. It’s very interesting to compare it with how it used to look like. Many sights and places around town are shown in the guidebooks, and many of them certainly don’t look like they do today. Below is a picture of Vabaduse Väljak (Freedom Square), at that time Võidu Väljak (Victory Square), showing it looking like a parking lot. 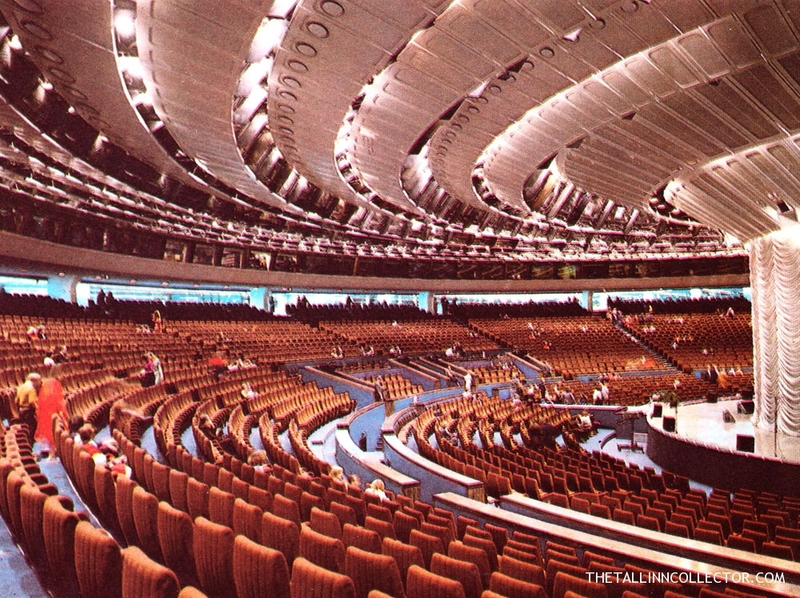 The Tallinn Collector is eye candy for those who are into Soviet architecture. Many places, like Postimaja (the post office in Tallinn), have been newly renovated; it now hosts H&M in its old building. It´s very interesting to see how they looked before. Postimaja, as well as some other famous spots in Tallinn, such as Linnahall, Hotel Olümpia and so on – are all results of the big development/renovation of the city before the 1980 Moscow Olympic Games, during which the sailing regattas where held in Pirita, Tallinn. I very much like the images and information provided about Tallinn’s suburbs – there’s a lot in the guidebooks. They often talk about how modern and new they are. The impressive Väike-Õismäe, oval in shape and built in the ’70s, is one of the greatest examples. I myself usually visit Väike-Õismäe when I go to Tallinn, just to breathe in the atmosphere of this historic suburb. Tallinn is pretty, picture perfect. In The Tallinn Collector I want to show that Tallinn has always been pretty – in the travel guidebooks, there are photos that make Tallinn look like a million dollars. I want to highlight the exciting historical material which I found in tourist guides. The Tallinn Collector is not just about showing Soviet propaganda, images of Lenin or Soviet architecture. I don’t want to make anyone feel uncomfortable or sad. Just as the history of Tallinn, connected to tourism, looks the way it does, it’s a part of the flashbacks. In the image below, we see the beautiful Kadriorg Palace (built between 1718-1725), one of the greatest landmarks in Tallinn, and the whole of Estonia. It’s mentioned in every guidebook and is obviously a great example of how pretty Tallinn is. The Tallinn Collector is all about focusing on Tallinn’s tourism history and the material connected to it. My aim is not just to collect as many images of Tallinn as possible and then post them online. Like in this image, of Hotel Tallinn (from the 60s), the very first hotel opened to international tourists by the official state travel agency of the Soviet Union, Intourist. I like to look at old images of the hotels, both inside and out. As well as reading, I also listen to stories about the Intourist organisation, who had a monopoly on the tourist business. Very interesting photos and stories!